The Beautiful Heresy- Christian Universalism: Is this you? I hope not. I really find I know very little when it comes to some folks on the net. Sorry if the following is off topic for the thread , but since I've been back to your site I've lost the way back tot hat area where I could read the comments I last left on the topic of universalism and being a borderline computer illiterate /computer clutz with computers and having dial up and not the latest point ) Iwas hoping you could help me find a way back there . Please either leave a message here or in my e-mail box at aol at mudstones2@aol.com . I've been earnestly wanting to read tany further commentary that you and others might have had with the posts I posted. I was able to visit and post shortle after Grandpa and I moved into the new apartment residence in July , but I haven't been back sicne July and now that I'm back I'm having difficulty getting back to the area where the comments I left were .There was a fellow who left some interesting comments regarding verses in zephaniah and i've been wanting to read those verses again . Well, it's not me, literally. But, back when I actually left the house for work, I can recall driving down the highway thinking "Ooh! I wish I had told her that!" and actually composing my next post in my head while on the road. Or, I'll wake up thinking about what how to respond to an argument. But, I pretty much shut down the computer around suppertime, too. I'm rarely on after dinner. 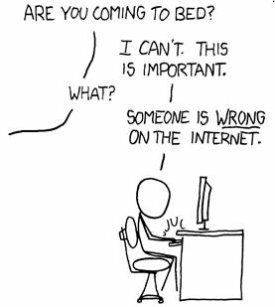 I have learned to live with the fact that some people are the internet are going to be wrong, no matter how much I try to help them ;-) But, I try anyway.